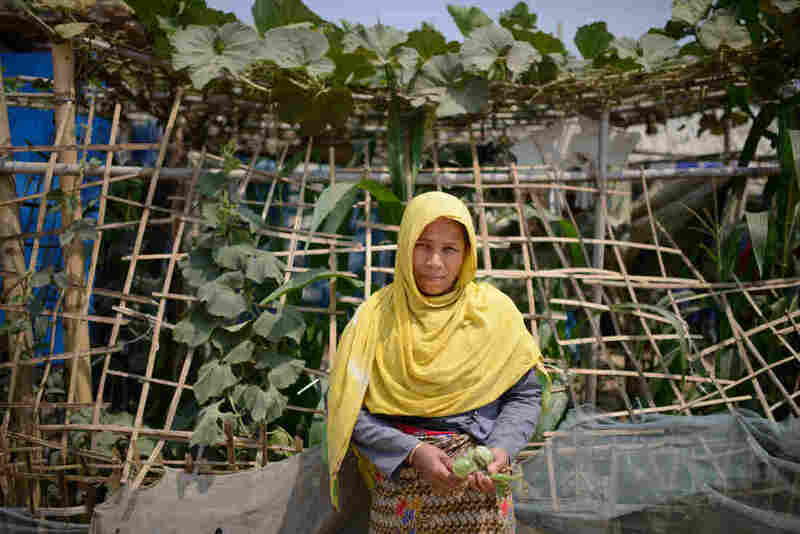 Rohingya Settle In For The Long Haul, Even As Bangladesh Wants Refugees To Go Home Bangladesh wants a million Rohingya refugees to go back to Myanmar. But 18 months after most of them fled violence, they are too afraid to go back and are making new lives for themselves in camps. Children play at a Rohingya refugee camp outside Cox's Bazar in Bangladesh. "We are here creating safe land for living," declares Mosa Alshalabi, a WFP engineer. "Because that soil," he says pointing at some sandy cliffs in front of him, "that soil is not safe at all. All these houses when it rains, the soil [beneath them] will be washed away." The Bangladeshi government continues to insist that the nearly 1 million Rohingya refugees crammed into camps like this one outside Cox's Bazar are just temporary visitors. It wants them to go home. But a year and a half after most of the refugees arrived, there are few signs that they will leave anytime soon. Shoring up land for new homes, growing their own food and enrolling in religious schools, they appear to be settling in for the long haul. There are even playgrounds popping up in some places, with solid metal slides and swing sets. "For example, that road wasn't here," he says. Pointing in the opposite direction, he adds, "That was a mountain. We cut that mountain to make a platform safe for living." 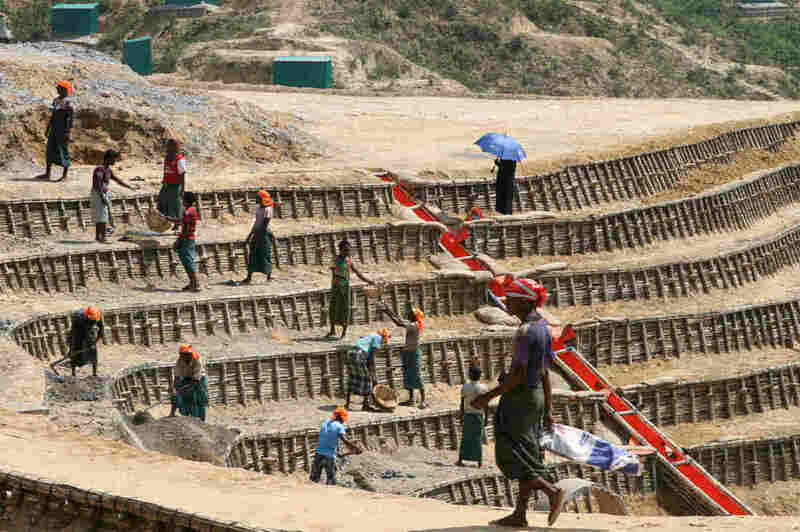 More than 1,000 Rohingya refugees, working on a recent day for the WFP's construction crews in an area called Camp 4 Extension, earn roughly $5 a day to move buckets of sand and dig drainage ditches. 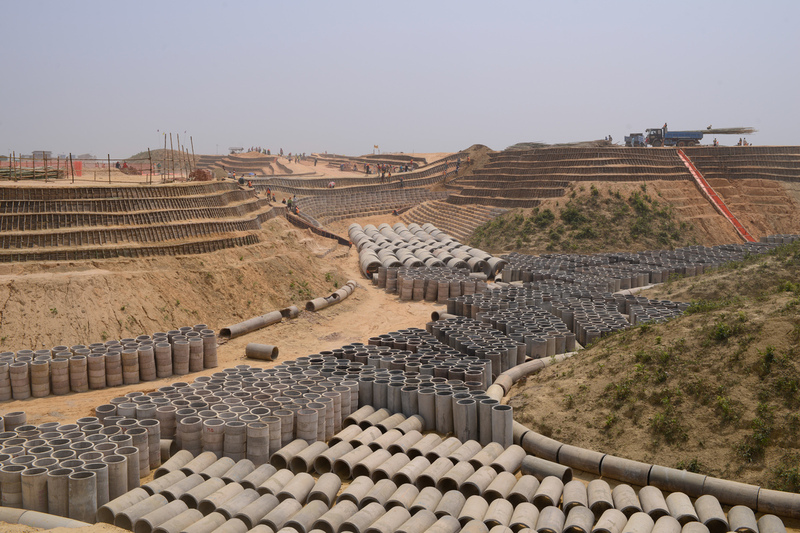 Construction is underway to put in drainage ditches and stabilize hillsides on the edges of the Kutupalong section of the sprawling refugee camp. The shored-up land will be used for new shelters for residents currently living in overcrowded areas of the settlement. The expanse of newly terraced hillsides, shored-up roads, dump trucks and work crews looks anything but temporary. Yet the Bangladesh government bans Rohingya from building what it calls "permanent" houses. So even the new shelters are made of plastic tarps wrapped around solid bamboo frames. "I would like to go back to Myanmar"
Rohingya Muslims are a long-persecuted ethnic and religious minority in Myanmar (previously known as Burma). They have lived in the region for generations, but officials in Myanmar refuse to recognize them as citizens, referring to them as "Bengali" — suggesting that they are from Bangladesh, even though they don't speak the same language — and limiting their movement inside Myanmar. Bangladesh says the refugees have overwhelmed the area around Cox's Bazar and has been pushing for them to return to Myanmar as soon as possible. Host countries seldom have the ability or desire to absorb huge numbers of refugees. But Bangladesh's campaign late last year offering free transportation and resettlement benefits to any refugee willing to go back to Myanmar had exactly zero takers. 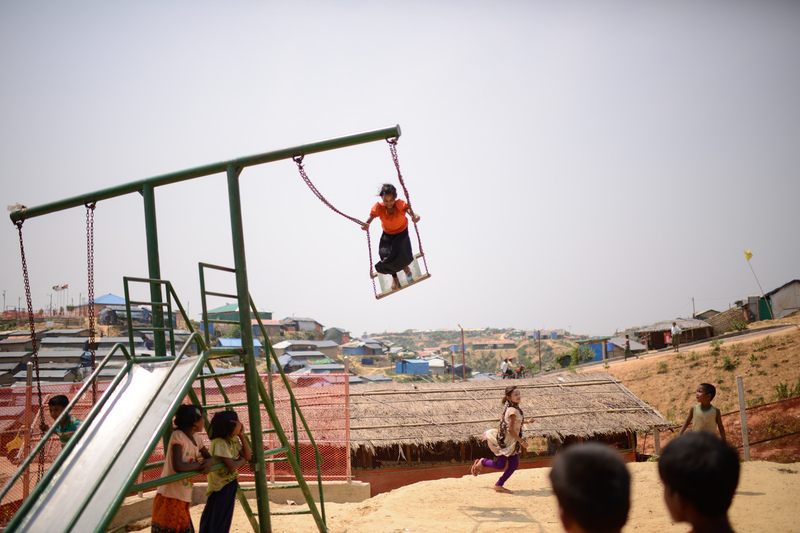 Balukali is a densely settled part of what is now the largest refugee camp in the world — it merged with another camp, Kutupalong, and the combined camp now holds nearly 650,000 people. This is more than twice the size of the world's next-biggest camp in Uganda, and about three times as large as the infamous Dadaab camp in Kenya. The Rohingya refugees in Balukali are packed so tightly together that the residents of one shelter can often reach out and touch their neighbors' hut. Workers have been trying to install solar street lights but have struggled to find enough open space to install concrete footings for the lamp poles. "I would like to go back to Myanmar," he says. But he quickly adds that it could be years before he's able to do so. For now, he says it wouldn't be safe to return and he doesn't know when it will be. "We want them prosecuted for the crimes they committed against us," Kamal says. "It may take a long time," Kamal concedes. To ease the long-term environmental impact of so many refugees — a population roughly the size of Denver's living in what used to be a nature preserve — international aid groups have built a massive sewage treatment plant on the edge of the Kutupalong section of the camp. Deep wells have been dug to try to make sure the refugees have access to clean drinking water. 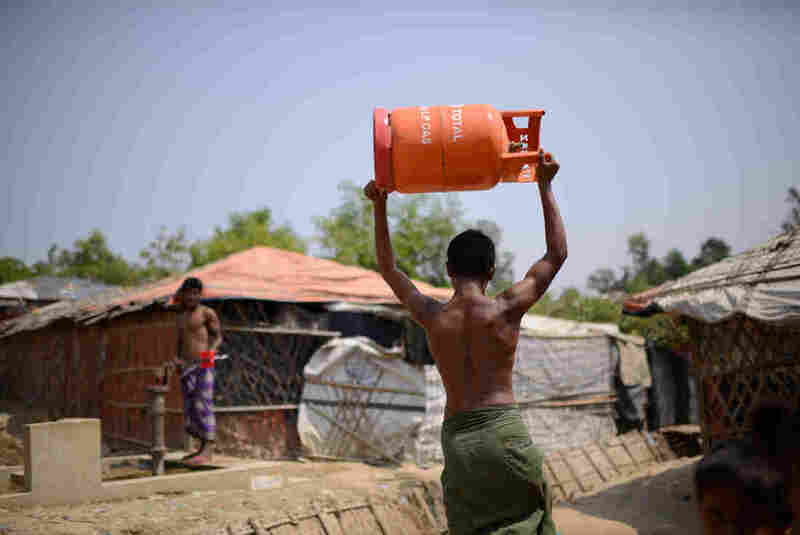 In response, aid groups have begun distributing single-burner gas cookstoves to every household in the camps. This has meant setting up distribution points for residents to swap their used canisters of bottled gas. The U.N. Refugee Agency (UNHCR) and other groups have budgeted $30 million a year for the bottled gas program. In another sign of this refugee situation shifting from crisis to long-term humanitarian problem, the World Food Program is moving away from handing out monthly rations of rice, beans and cooking oil to every family. Instead, it is creating retail stores where refugees can shop for groceries using electronic rations cards. Each month, rather than shipping tons of food, the agency will simply load credit onto the refugees' cards. Refugee children still aren't officially allowed to go to schools. Bangladeshi officials don't want the kids settling in. UNICEF and other agencies have instead set up "learning centers" and "child-friendly spaces" where Rohingya kids go for an hour or two a day to study math and English. But Bangladeshi officials don't allow the Rohingya-speaking children to learn Bengali. Arfaan's seminary is funded by an aid group from Malayasia. Classes focus on the Quran and Islamic studies, but students can also learn Arabic and English. 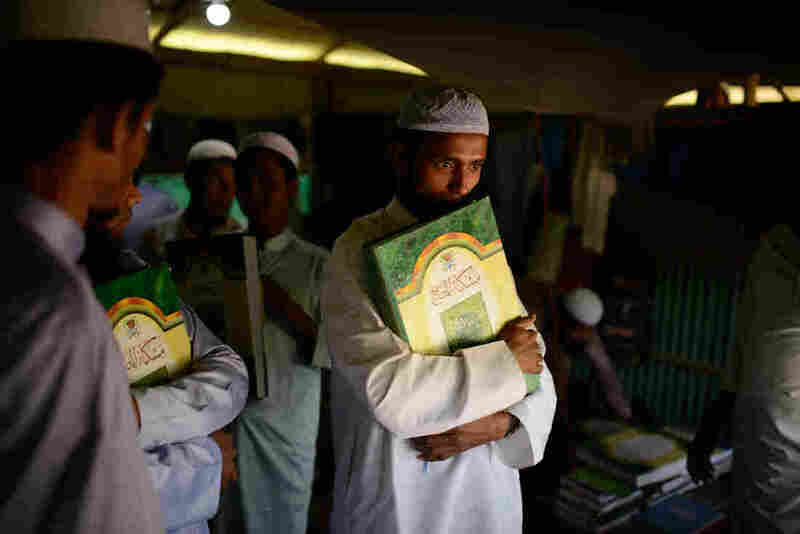 The madrassas fill an important role for many Rohingya in the camps, he emphasizes. "It's important for us to study our religion because we will die one day," he says. "It's important for us to study languages to be able to speak with you in English and with people in Arabic for business. We need to educate teachers so they can educate our children." "I'm very happy here," says Fatima Katu, a 40-year-old mother of six standing next to a huge squash vine that's climbed up on to the roof of her shelter. Katu recently moved with her husband and children to a new cluster of homes in Camp 4 Extension, among the neat rows of shelters made of tarps and bamboo. Compared to the cramped shelter they first lived in, she says, "We have more space here and now it feels like home."